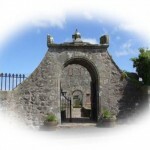 Lychgates are not particularly common in Scotland and the stone-built Longside lychgate is a fine example of only two thought to remain in Scotland. Many lychgates were built of w ood and so have not survived. Although bearing the date 1705 on a finial, the lychgate probably dates from the building of the first church in Longside in 1620. The word “lych” comes from the Old English for “corpse” and the purpose of the lychgate was somewhat of a luxury in the days before the use of coffins. The deceased, wrapped in a shroud, known as the mortcloth, would be placed under the lychgate for shelter while the minister conducted the first part of the funeral service. The recesses in either side of the gate were sometimes used as seats for pallbearers. Longside’s lychgate gives access to the roofless 1620 Church building, both it and the lychgate now being in the care of Aberdeenshire Council.